AB 51 passed the California State Senate Transportation Committee yesterday with no opposition. The amended version of the bill can be reviewed here in my post from May 27th. The bill passed 11-o, and will now go to the Senate Appropriations Committee. Note that the Committee Chair is Senator Jim Beall, who sponsored a poorly worded lane splitting bill, SB 350, back in 2013. That bill saw some activity across two years, but ultimately died in 2014. Here’s the video of yesterday’s hearing—the discussion of AB 51 starts at about four minutes in. Most of the testimony was on point and very positive, but it’s disappointing to hear the old “air cooled bikes need to keep rolling” argument being trotted out and the safety value of lane splitting presented as a side issue. We already know that it’s easy for opponents to discount or completely dismiss the hypothetical overheating issue, while the safety component is 100% defensible and universal, supported by studies on lane splitting—and therefore much harder to dismiss. 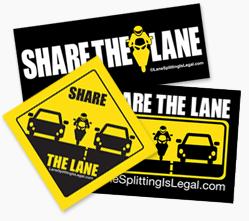 For riders who reject the very concept of lane splitting legislation on the grounds that “once there’s a law, The Man will just regulate it further; tickets and fines will follow, and then a ban,” frankly, that line of reasoning is nonsensical, but it’s important to note a specific exchange in the hearing: When Senator Anthony Cannella and Committee Vice Chair asked “When the CHP is developing these guidelines, is there any possibility that they could just ban lane splitting ?” Quirk responded simply, “No.” He then added, “…so we’re not establishing a speed limit or anything like that. They’re educational guidelines. Can’t ban, or anything else.” The language of AB 51 reflects this. If you’ve been following the developments around lane splitting in California for the last few years, you’ll recall that the SafeTREC research on lane splitting / lane sharing reinforced the importance educating both riders and drivers via the CHP guidelines. The best thing you can do to help keep this bill rolling is to contact your state senator and ask them to support this bill—you can find your legislator here. Please also share this information with other California riders and ask them to do the same, and stay tuned here or to the LaneSplittingIsLegal Facebook page for updates. This should be all over the moto websites, but so far, nearly nada. Well, it’s showing up here and there now—some people are essentially ripping off this article. Surj, thanks for all the hard work on this. I can’t believe the way some of these trolls (for lack of a better word) come at you. Keep fighting the good fight.